Today at Saratoga (1st race), per Equibase: “METEOROID…took a bad step strides before flight six and had no other option but to remain on course, cleared that jump and was quickly pulled up but unfortunately had to be euthanized on track.” “Unfortunately.” Just to be clear, Meteoroid suffered his “catastrophic injury” (a break of some sort) before the sixth hurdle, but still had to make that jump before being pulled up and, eventually, put out of his misery. Imagine that. That’s 14 dead racehorses on the Saratoga summer. 14 dead animals for $2 bets and frivolous entertainment. Does that not define morally indefensible? I’m also totally disgusted with the ladies in this picture flashing their fancy hats while they are clueless ignorant patronizers of animal cruelty, inhumane treatment, and dying of racehorses. I can’t help to think about all the racehorses who died anonymously on this “premier” Saratoga oval prior to this blog exposing the horrific, ugly, and repulsive business of racehorses dying. Meteoroid – so sorry for you. We will continue to be a voice for racehorses like you because this industry doesn’t give a damn. Yo lady, chill. These birds aren’t even at Saratoga it’s a stock photo. 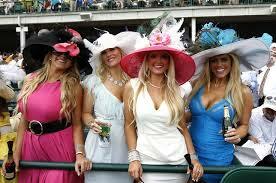 I don’t think some basic broads that only go to the track to don their best “pretty woman” garb are to to blame. NYRA won’t shut down the track to fix it. The breeders, managers and Jockies are missing out on a paycheck because their vehicle to fame and fortune is at risk. Horses are a beloved commodity to those people– just like hats to the princesses in the photo. So chill. I hate to disappoint you Linda, but “chilling” is not part of my agenda. However, exposing the truth about this barbaric bloodbath is. Stock photo or not they are patronizing this vile business wherever that may be. You can’t be serious right? So doping, whipping/beating,maiming, dumping, and/or dying is love? Your twisted logic is so typical of these animal abusers. The broken bones, and blood pooling under these dead racehorses are nothing to be “chill” about. Then again, delusional people like you are nothing to “chill” about either. Listen — it MUST be all about the horses, IT MUST — Running for fun is one thing, BUT running to the death is quite another — all this brutality is at the hands of the humans — if you’re unable to have fun for all : the audience, the bettors, the riders, the groomers, the reporters, the trainers, et al., AND — especially the horses — then this industry must be shut down — you’re cruelly abusing the horses — this is unconscionable, sadistic, hateful and immoral AND it should be illegal — LET THE HORSES HAVE A HAPPY LIFE — stop working them to death!! Morally indefensible – it most certainly is! Part-owner of Meteoroid. I was in tears after watching this. Everyone can say what they will about the business & I respect your points of view even if they don’t agree with mine. With that said, I am not attacking you so please do not attack me, I am still taking it hard. If you look at his past performances and Work pattern, we respected the horse and didn’t run him into the ground. Just wanted to let you know that there are owners that do care and that we would’ve saved the horse but felt it was right by the animal to euthanize him…didn’t want him to suffer anymore than he already had to. I am not out to demonize any individuals, just the industry as a whole. As a rule, I don’t attach connections’ names to dead horses; yours does not appear in my post. As for your tears, they mean nothing to me. Fact is, you put this animal’s life in jeopardy each and every time you thrust him on the track. And for what? Don’t be upset with me for pointing out the obvious. Look inward. Patrick, not upset with you at all. You have your views & outlook and I have mine, can’t blame you for that. Just wanted to offer some more insight into the whole process, which I think you should try to do. For example, earlier in the meet NYRA vanned off Sweetneida in front of the crowd to cheers and applause, deceiving everyone that she would be okay when she was put down when she got back to the barn. That was unnecessary and deceiving. Attacking is one thing, but pointing out the truth about this business is mandatory. Elizabeth, you are delusional like I was at one time. Then I realized that you can’t “care” and “love” any racehorse while subjecting it to the mandatory operating procedures of doping, whipping/beating, risking their life/limbs, dumping, and/or dying. There’s not one racehorse on the track that has not received at least one needle full of something at one time or another so don’t fool yourself because you are most certainly not fooling me. I have no sympathy for you or for your tears. My sympathy lies with Meteoroid who died in the dirt yesterday and you were largely responsible for his death. You gave the nod to send him out there. There is no such thing as owners who “care,” there are only owners who exploit. You can’t love racehorses and love horse racing – it’s a dichotomy at best. She is active on her FB page, and very approachable. Like you, she had a horse die on the track and it was from that point on that she changed her entire outlook about this business like any moral, and sane person would. Yes Elizabeth he suffered long before he died yesterday because he was intensely confined, and most likely turned into a pin cushion so that you could exploit him. That’s the truth, and if you can’t face it then there is something wrong with you like all racehorse owners. Elizabeth – I doubt anyone here would take issue with the decision to euthanize Meteoroid (“we would’ve have saved the horse but felt it was right by the animal to euthanize him”). The issue is the fact that what he was made to do (exist in the stressful, isolated and unnatural life of a racehorse and made to “compete” in a very high risk activity) is what stole his life from him – even while alive. And that was all so unnecessary….he didn’t need “to suffer anymore than he already had to”? – why did he “[have] to” at all? His suffering was much more than his tragic breakdown and subsequent death. And for what…. We will have differing opinions and nothing is going to change that, but thank you for presenting yours respectfully. We don’t have to look at past performances or work pattern or soundness. Meteoroid is dead simply because you RACED him. THAT is our shared guilt and we have to bear it. You COULD have “saved the horse” if you had not raced him. I figured out that there are no racing owners who “do care” because racing and caring for your horse are mutually exclusive. Speed kills. Racing kills. Own it for the rest of your life but do not make the same mistake twice. If you are a caring owner like you state, do what I did and get your horses out of racing. That’s how you save them. Well put Jo Anne – thanks. Every horse owner should read it. Furthermore, I can never, ever understand WHY somebody would continue in this business after their horse dies. It’s NOT OKAY, it’s not normal – get your horses out, and educate people so more racehorses don’t have to die. According to equibase.com, the owner of Meteoroid was Amy Taylor Rowe. Carolyn, thank you for pointing this out. I read that last night in a newspaper article. So “Elizabeth” do you have illegal hidden ownership or are you a liar like the rest of those in racing who claim to care or love their horses? This blog is very educational and I will be sure to put it to the best possible use. The public must be made aware of the inherent cruelty and danger in this business. Actually, this is more shocking than I ever could imagine. 119 LEGAL DRUGS ARE ALLOWED IN RACING HORSES BODIES- PLUS MOUNTING THEM TOO YOUNG AND WHIPPING AND PUSHING THEM-THUS CAUSING THEM TO BREAK LEGS- THE AVERAGE PUBLIC HAVE NO CLUE- ITS USING HORSES FOR A CRUELTY EVENT TO GAMBLE MONEY- A SAD CIRCUS . I just looked over the PP’s for Meteoroid, and they are a disgusting display of animal abuse. With a prior DNF, and continuously putting this horse into Maiden Special Weight when he so obviously didn’t belong there. He didn’t even break his maiden, and they stepped up his game into an Allowance race! He was pushed way beyond his talent – for what? For dying in the dirt for an owners who exploited him, and for people to make a $2 bet – disgusting. Like I said, just offering you my views. I am not going to change how I view stuff and I don’t expect you to change yours. With that being said – the DNF wasn’t because of an injury or because she bled. She lost her rider because Paddy Jones’ feet fell out of the irons – check the charts. I’m just trying to say that there are some people who put their horses in more risk than others and we were not part of that group. I understand and take full responsibility for Meteoroid breaking down – but we didn’t treat him like notorious trainers/owners Asmussen and Zayat. Also, would like to comment…there is 100% something going on at Saratoga. 1 horse death a meet is tragic, let alone (currently) 14. NYRA knows that the (dirt) track at least is some of the issue (shady characters always – but they’ve been around for years…this year fatality rate is higher than normal). Not that this has any relevance to Meteoroid since Steeplechase races on turf, but just a comment from what I’ve heard. I personally will not be racing a horse on Saratoga dirt this year, although I could. Each and every time a track gets unwanted publicity (on deaths), the excuses start to fly – the surface, the weather, the whatever. Fact is, Saratoga has averaged 13 deaths a year since the database began disclosing such things in 2009. What is happening today – and we’re up to 15, by the way – is no anomaly. It’s business as usual. Read my site, particularly the Killed lists for 2014, 2015, 2016, and this year. Horseracing kills horses – lots of them. That Just has nothing to do with what I said and not sure how you derived only that from my comment lol. Like I said, our opinions will be different, If I give you a ticket, maybe you can come cheer for my horse in the next steeplechase race in one of the owner’s boxes, how’s that sound? Elizabeth…”part-owner” (strange how a partnership is not mentioned in an article I read about Meteoroid’s death – just ONE owner was reported)…your last comment? – snarky and snide? – with an “lol” thrown in for good measure? – your “grief” over the DEATH of “your” horse was certainly short-lived. Elizabeth, you really need to get your mental state checked. You are in full blown delusional mode like anybody who watches their horse DIE, and still continue in this vile business. If your horse dying doesn’t change you then nothing will. Furthermore, your invitation to Patrick and all of us here to go watch your next horse potentially die is a pathetic grasping at straws offer that bears no weight on here. I have no interest in watching a modern day torture show, and blood bath nor do I have any interest in supporting such horrific abuse of animals. There are some people that never learn in life, and you Elizabeth are one of them. You still have time to turn around and do what’s right by the horse. However, I wont be waiting for that moment as I’m too busy addressing the continual dying of racehorses on tracks, and picking-up the broken, maimed, and dumped horses of this barbaric industry. Omg, wow. This just proved the mentality of how much people on the tracks “love ” their horses. To see one have to be forced to make a jump with a broken leg and yet you can’t wait to potentially see the same thing happen to the next one? That’s gross. So is that a no on the ticket? What about if I have you meet with our hockey? Thst could be a nice meet and greet session! You’re a fraud. And you’re done here.